For the next three weeks, Robohub readers can vote for their “Readers’ Pick” startup from the Robot Launch competition. Each week, we’ll be publishing 10 videos. 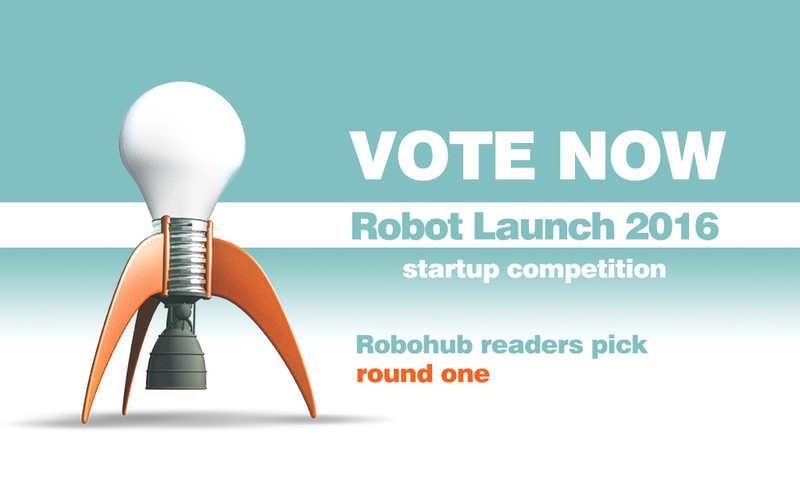 Our ultimate Robohub Readers’ Favorites, along with lots of other prizes, will be announced at the end of November. Every week we’ll showcase different aspects of robotics startups and their business models: from agricultural to humanoid, from consumer to industrial and from hardware to robotics software. Make sure you vote for your favorite – below – by 18:00pm UTC, Wednesday 9 November, spread the word through social media using #robotlaunch2016 and come back next week for the next 10! We are building a platform where companies can access any kind of solution and know that it will work on their robot, drastically simplifying development, testing, and deployment. bridgeOS, by Bridge Robotics, is a cloud-based platform to run service robot applications. It allows users of service robots to easily manage and use robot applications with different robots and different skills. bridgeOS also provides developers not expert in robotics with a framework to help build robot agnostic applications. Emobie is a social robot companion for kids with emotional and learning challenges. Emobie helps kids to understand and express their emotions and keeps them company throughout their day. The Internet of Robots is a system designed for easy assembly of robots. It’s internet, electronics, hardware and software combined. You can send data, manage environment data and see what your robot sees. Just pick the modules and start creating your Internet of Robots. Autonomous solar-powered helium dirigible for long duration aerial data collection, inspection, surveillance and videography. Can do anything a multirotor drone can do, but for 20 times longer, such as, stay in position in wind, patrol, circle or fly at up 20 miles per hour along a set of waypoints. There are 50 million students in K-12, 90% of them do not learn coding. This is juxtaposed against the 1.4 million computing jobs needed by 2020. Robolink strives to address that issue by making STEM education fun. We teach children and hobbyists programming by building and programming robots. We provide a novel tactile sensor that can measure proximity, contact and force. Our sensor sits where the rubber hits the road in robotic grasping and manipulation and is extremely low-cost and orders of magnitude more useful than any competing technology. Proximity helps the robot to align its hand with an object and avoid obstacles. Contact sensing allows the gripper/hand to create a constraint with the object without disturbing it and force allows it to gently handle an object and better understand how the object is located in the hand. We are selling the sensor for a growing number of platforms including Rethink Robotics Baxter/Sayer, Kinova Jaco and many more to come. We are also providing full-stack software that make manipulation easy. We are developing an end-to-end 3D printing automation platform that will power the next industrial revolution. We have turned the conventional 3D printer into a continuously-operating production line by fully automating the entire manufacturing process from design to doorstep. The disruptive nature of SD3D lies in its network qualities; it resembles a SaaS platform on the front end and is powered by an advanced IoT automation network on the backend. We have introduced the sense of touch in mobile robots and makes them suitable for narrow and crowded environments. We have patented a tactile technology that consists of a soft pressure-sensitive skin together with a control algorithm. Our technology makes the robot completely safe because the robot stops as soon as it feels the presence of an unexpected object or person. We have an advanced radar system, measuring just 1″ x 2″ and weighing about 7 grams. It brings reliable, robust, accurate and high-speed distance sensing to drone platforms.